But maybe you should check so they dont have any wacky rules about gore in the compo? Thanks guys. Cliff I checked the T&C and it doesnt say anything against violent games. Also the Intel AppUp store has games with gore in them. Also the video I showed to get the UltraBook had the blood spray effect. Here is a pic showing the players death in more detail. Ive still got a long way to go to get this game ready. 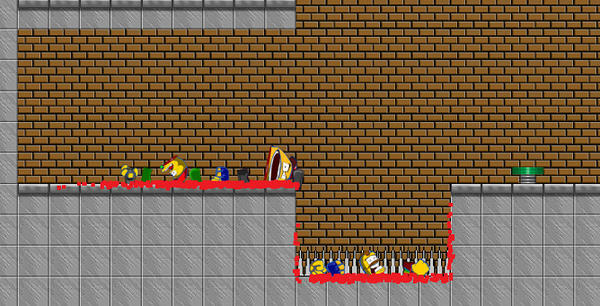 Ive still to add in the Zombies and still to make the levels. Im aiming for 10-15 levels for the beta release for the 2nd round of the competition. If all goes well Ill post here an early version next week with 5 levels for testing. Quote: "Im aiming for 10-15 levels for the beta release "
Thats a good choise as the amount of levels can always be updated when its up. My aim is 12 levels for first release. They are a true pain. Quote: "I haven't got my certificate yet, ill be doing that tomorrow. Apparently a lot of people have had bother with them. Ive no idea why Intel require this certificate as it was never needed before	"
Keep in mind of these things i have learned! Use your real name for organisation name. They will ask for digital copys of phone bills and such etc to verify that you have stated your real adress in your registration. They will also ask for a digital copy of your id or drivers license to verify that you have stated your real name when registering. If the link from appup to comodo dont work as it should add an s to http. Here is an link to code projects help article about all the steps. Quick update for the game. Ive added in some destructible tiles in the game. So some tiles can be destroyed if there is an explosion near them. Also Ive added landmines into the game. Only the runner character running at full speed can outrun the mines explosion. Thanks Cliff. The gore is also used as a game play mechanic. The video below shows the games accelerometer controls. When a crate or barrel is on a blood soaked surface the player can tilt the screen to make them slide around. I don't have the Zombies in the game yet so the video shows me murdering one of my own characters to complete the level. the video of your game and using the tilt is very good. I dont see to much games using tilt. i planning to use tilt left and right when i get to that point in my app game. i just starting, got a long way to go. Thanks leo877. I originally did not plan to use tilt controls in my game, but decided to do so as part of the UltraBook Competition. It was really easy to add in with only a few lines of code. Looks like Lost Vikings for the Super Nes, one of the games I played in the 90's. That was a very fun game. Guy with a shield blocks attacks i wonder if you will use his shield as a glider, red bearded guy jumps and shoots. Then there the guy with the bow. Same game just a little different I guess. Yeah 3d point in space I wanted to make a Lost Viking style for years. No my game wont use the shield as a glider. My game will be less linear and have a lot more physics based puzzles. Also not everyone needs to survive to complete a level though youll be graded on how many of your characters you get to the end of the level. The beta version will have 3 characters but the final game will have 4 with the 4th character having a hookshot. Have you started to playtest it on your ultrabook? I found a bunch of problems when i started. The apps must be in full screen that is solved with overdraw. But this gives problems of blank corners of the maps. I made an temporary fix where i added an value to the setview offset. Solved the issue for me in fullscreen. Seams to work on multiple resolutions but who nows? Yeah I moved development of my game onto the UltraBook. I haven't had any issue running my AppGameKit game on my UltraBook it runs fine. I dont use Box2D maybe that might be at fault with yours. Im still using AppGameKit 1065 right now so that I can use my PlayBook to test the touch and tilt controls. Also Ive been working on the games zombies. Ive still to finish their AI but heres an early video of one in action. Do you really nead that advanced ai on them ? You could do some neat tricks with simple event nodes for them on the map. Quote: " I haven't had any issue running my AppGameKit game on my UltraBook it runs fine. I dont use Box2D maybe that might be at fault with yours." Its a part of the problem as box 2d have its own timed movement and agk itself dont like v sync in win 8. So i got choppy movement by box 2d. And poor framerate and screentearing by agk. But its solved and will be in the next agk update. But it plays good enough for playtesting if i turn off the save battery option in the sync command. Nice is coming out nice!!! Quote: "Do you really nead that advanced ai on them ?" Not really advanced but I wanted to get the zombie actions to look correct. Apart from simple movement, and attack AI, I also had to add in a crowd control method to stop the zombie merging together when they move in the same direction. Heres a video showing crowd control working. Thanks Ancient Lady and xGEKKOx. Ive just finished the games GUI and now Im working on the first drafts of the levels. Here is a video of me playing one of those levels on my PlayBook. Iam on track to get the beta version of the game ready by the 31st of October though I need to wait for the AppGameKit beta update to implement the senors into the game. Impressive. I suspect this will do quite well when it hits the market. Yes i will buy it for sure. Is really nice, and the idea (remember to me a game i loved much : Psychic 5) with nice features to move the object! And i also like the clear tiles used. I will have to see if i manage to do anything inside the timeline of the compo. This reminds me of Trine, but with a better character/puzzle mechanic. Having to use all the characters to get to the exit is an awesome idea. I see this being very successful! Thanks Josh Mooney. My character/puzzle mechanic is based on the game Lost Vikings for the Amiga. Though I hope Ive addressed the issues that some people (including me) had with that game, as well as add in alot of my own physics based puzzles. Im planning to release a demo of the game here later this week though since the UltraBook sensors have yet to be added to the AppGameKit the demo will be for the PlayBook and/or Android. Ive been mostly working on the games menus the last few days though Ive been getting the game ready for UltraBooks. Ive also added sound effects, and music though these will change when i get better ones. This weekend ill be building the games level editor, and building the games levels next week. I hope to have the version for the competition ready by next Friday. Quote: " Ive also added sound effects"
I would suggest sound fx that are more to the cartoon style. Now do i mean the old roadrunner toons with acme explosions and exaggerated fx sound. The splatt sound when the zombie dies is good but maybe add a small echoe and bas boost to it? And maybe dont have a sound for walking but only for landing and when they do actions like stopping or jumping. Thanks for the feedback. These right now are mostly placeholders. My problem is I need to find sounds that are royalty free and cost nothing. There isn't a sound for walking, but one when the blocks are pushed. Quote: "My problem is I need to find sounds that are royalty free and cost nothing." I have the advantage of an huge database with various sound effects. I have an comercial developer license on the old prg klick and play where there is a couple of hundred sfx i can use. But i cant share them for more then in my own projects. I have also gathered thru the years a whole bunch of free sfx on one of my extra hard drives or one of my cds if i can remember wich one? I will see wath i can find for you or an link to free sounds database. I wish i had more time to help you on that part free of charge as i like your game,but as you know i have my hands full with my own entry. Any specific sounds you are after if i find any? I will upload them here in your thread when i find some. Maybe you could find some here? They have 55 sites with free sfx listed. The first one listed is probably one of the better and easy to browse thru. Its been a while since my last update. Ive had to rewrite alot of my code due to issues with Beta 3. Ive managed to solve all of them bar the random crashing that sometimes happens. It mostly happens when I compile and run, but it can happened at anytime even when I exit the game. Apart from that Ive built the 1st version of the map editor. Its not perfect yet but I plan to include a better version with the games 2nd beta release (mid to late December). Heres a video of the games 3rd level. Quote: "Ive managed to solve all of them bar the random crashing that sometimes happens. It mostly happens when I compile and run, but it can happened at anytime even when I exit the game." Does it happen in win 7? I thoght i whas win 8? If they dont have an quick fix for agk 108? Looks nice by the way. Only thing is that the levels seam a bit to little detailed? Some windows in the back or sewer exits etc. I plan to have background tiles like windows, and painting in the 2nd beta release. The games artist is on holiday and Ive not got the time this week to code them in. The crashing happens on Win 8. Does the same thing happen to your game? Im hoping to have my game submitted on Friday. I had planned on doing it earlier but beta3 has set back the project. Yes i noticed after uploading my game that it sometimes but rarely get this stopped working message. Got it once while playing and mostly when ending the app. But it seams more to be an issue with win 8 or something? If i play my game 30 times so does this happen 3-4 times. But don't you think that the level design is too straightforward? Look at Lost Vikings, they use multiple floors and different paths for the characters. Demo 2 is out! Click the image for more. Digital Awakening Yeah these beta levels are very linear. The reasons for this is trying to get some levels ready for the UltraBook competition. Think of the level as a tech demo to show off the different gameplay mechanics that will be in the final game. Im getting a game designer to do the actual levels for the game while I work on the coding of the game. How is it going with the game for appup? Have you solved your problems? Thanks Cliff. Im still working on the bug in which the the game will crash on closing after loading up one of the last 3 levels. Right now im stripping out all the game objects to see what is causing the issue. Did you have any problems with your game crashing while it closes down? It happened very rarely at exit and once while playing. But you posted something about set sprite frame that could be something as i do this very often. But i couldt mimick any crashes now that i wanted? Here is how i end my game and as you can see i have separate loops for each screen. Thanks Cliff. It seems that problem only happened with one sprite type. I removed it and my game runs fine. Im currently making the msi installer for it right now. I submitted a version of the game that still crashed on exit if a a combination of option menus and levels are accessed. Seems to be due to the sprites animations calls. If I commented out a playsprite or setsprite frame an other sprites animation would cause the crash. So in the build I sent the conveyor belts don't rotate. Now that the competition is over I can now get back to using AppGameKit 1065 to work the PlayBook and BB10 version. When will you add more level details? The plan right now is to get the game working full speed on the PlayBook. Ideally I want it running at 60fps like the UltraBook version. So I'll be adding more level details after that. I need to get the artist to work on some background sprites. Apart from windows any suggestions? Add variations to the brick tiles. Thanks for the ideas, ill get the games artist on them. I already have the artwork for pipes in various directions, but I didn't have time to add them into the game for the competition deadline. Zombie Hangover 82 has passed validation for the Intel Appup Store! I don't think I'll be one getting the $1000, but I hope I'm in with a chance to win one of the other cash prizes. It has 3 control schemes keyboard and trackpad, touchscreen, and game controller. Plus it uses some tilt controls too. Also I have been working on getting the game running at 60fps on The PlayBook. Its now almost working at that speed. The one on the Appup Store will be slow to load levels but my new build (wont be released till after the competition) loads levels instantly on PC, and 3 - 5 seconds on PlayBook. I've been working on improving the performance of the game to run on full speed on the PlayBook. One thing I've don't is to reduce the amount of sprites it takes to build the levels. I've manage to do this by adding some AI into the level loading function that checks to see if the tiles around are the same, and if they are then load in a larger image. For example if the game detects that two tiles beside each other are the same them it will load in an image that contains 2 tiles. This video shows the AI used to intelligently load tile sprites to minimize the number of sprites needed to build a level. Wow, pretty cool. That saved you a ton of sprites doing it that way. Thanks for the tip might try that when I attempt a tile game. Been thinking of doing an isometric tile game. How is it going with the development any news?